lessons in every kind of Magic. your way to Magic stardom! This is a great book whether you are just starting out in magic and "want to do it right" or if you're a seasoned pro looking for some more "ammo." 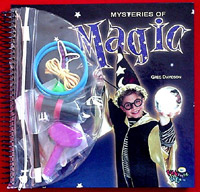 48 pages, hardcover, spiral bound with full color photographs and of course, the Magic kit! it's amazing! Oh yeah, the other reason is, it's also very simple to do. Here's what happens. You take three separate pieces of rope and show that they are also three different sizes; short, medium and long. Holding three of the ends in one hand the other hand brings the bottom end of each rope up to join the tops. Now with three ends in one hand and three bottoms in the other, you separate the hands and the ropes seem to visibly stretch so they are all the same length. This trick really looks like real magic! When you're ready, you simply reverse the magic and once again the ropes are back to three different sizes. Get this - you can immediately hand them out for inspection. The ropes are absolutely 100% rope, no elastic, no pulley system, no silicone implants; just rope. That can mean only one thing. You must be a Magician! You get the carefully made ropes and the step-by-step photo instructions. I've used this rope trick for over 25 years and today it gets a better reaction than ever. It's got everything; a logical beginning, a confusing middle and a surprise ending and, did I mention you can do it right away? I know, that sounds iffy, but it's true. It's simply great. You start off by showing a length of rope. You know, one rope-two ends right? Oh, come on! This trick blows their minds and is super simple to do (if you have the right stuff)You get it all. The specially-made, gimmicked prop, the step-by-step photo instructions; that's all you need and, "It's Show Time!" When you purchase both the Professor's Nightmare & the 1-2-1 Rope Trick, we knock off 5 bucks and you knock out more people with your amazing woven wizardry. We'll also tell you how to get from one trick to the other to create a rope routine that really plays big and packs small. In your hands are 1,2,3,4,5,6 cards. You count them out. Then you take three away and hey, wait a minute there are still 1,2,3,4,5,6 cards. What is this, a magic trick? Yeah! there are 6 okay, got it. The you peel off another 3. But there are 1,2,3,4,5,6 left, that's impossible. Not for you. You do it again. where are they coming from anyway? Are you a card shark, a master manipulator? Nope, just a smart magician. They'll never know it's easy as 1,2,3 and then of course, 4,5,6. These hand-made cards do all of the work and you sit back (or stand up proud) and "deliver the goods". This is a trick that you can perform in a living room, a boardroom or a packed room. Where do all of those cards come from? Only you will know. This is the same effect as 6 Cards Already but instead of playing cards, real money multiplies right before their very eyes. That's right, genuine US green backs, cabbage, cash, bucks, keep coming from nowhere. This is a great trick already but when you add the element of making money, money and more money by Magic, well let's just say, there's a whole new reason to pay attention. It costs more than 6 Cards Already (described above) because the money used in this professional set is the real McCoy. This is a great boardroom tie-in to finance, saving, investment, banking etc. You get the bills, the step-by-step photo instructions and this mighty Midas miracle. Here's a trick that will blow you (and your friends) away, literally! You blow hot air (you supply the hot air) into a tiny soda bottle. Suddenly a rainbow-colored string magically floats up, out, down, then back in through the bottom of the bottle. This is very hard to explain in words and it's pretty confusing, live, close-up and personal too but the string is in a continuous, liquid like motion. You'll have to stop while people do a few "oohs", "ahhs" and "what the hecks." Okay, that's cool enough but listen to this. 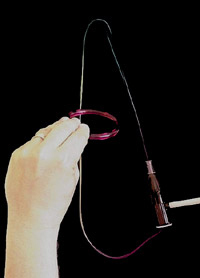 While the string is making it's "rounds" you push a solid hoop right through the side of the string. That's right, the hoop penetrates the string and even though you see it with your own three eyes, it just can't be. You can even have spectators hold onto the hoop and do it themselves! Believe me, when you first do this you won't believe it, it's Wwaaay Cool! This is a great for getting instant attention and interaction during Walk-Around Magic or you can just carry it in your pocket and pull it out when you want to see people scratching their heads. You get the Trick-a-Cola bottle and blowing stem, the hoop and the step-by-step photo instructions & performance tips. we're not worthy!" This is a very pretty set, not the "El Cheapo" version that you find all over the place. You get the shimmering zinc plate chain with brass D rings, the genuine Master Lock, they key, the step-by-step photo instructions & performance tips. Okay, you take the drama of Out of Siberia and you super-size it so it's bigger, bulkier, noisier and even more impossible looking; that's what Out of Siberia (Super Stage Size) is all about. This is the ultimate upgrade from our already striking deluxe equipment. The chain, the lock rings, even the solid brass locks are much larger and that much more impressive. Again, the quality of this set is most impressive and professional looking. It's not a kid's toy. You get the Blue Chrome chain and O-rings, the case hardened Magnum Master Lock, the key, the step-by-step photo instructions & performance tips.
. whatever. When they are finished you turn the towel back around and the audience falls over with laughter! Why? because now the towel is covered with horrible black handprints and smudges and looks like a diesel mechanic used it for a shop rag. It's a huge surprise, especially to the helper; their eyes usually bug out and they immediately look at the palms of their hands (as if they might have been that dirty!"). Hand-y Wipes is hands-down winner for magicians, emcees, clowns or anybody who likes to make people laugh. You get the specially made towel, the step-by-step photo instructions & performance tips. you are a fake, a cheater, a fraud. The goblet is attached to the plate by some unseen force. Quickly you attempt to cover up by grabbing the goblet off of the plate's edge but it's too late, everyone is laughing at you (and most importantly they're also laughing with you.) You show both sides of the plate again proving there was no way even that could have happened and you ride the wave of laughter into your off into the sunset and your next trick. This is a very cool trick and it's a ton of fun to perform. It's even fun just to play with, practice with and make faces in the mirror around. The cool mechanics of this piece make it James Bond sneaky-good and yes, the props do all of the work. Obviously this is not the children's stunt where you support a tumbler with your thumb. This is a transparent goblet and unless you've got a thumb the length of a carrot, there's just no way. You just make the faces and say the "taa daa's" and wait for the laughs and take the applause! 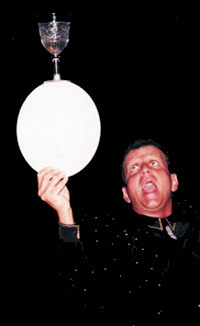 You get the specially gimmicked plate and goblet, the step-by-step photo instructions & performance tips. Let's assume your name is Goober. Let's also assume you are a man. You begin showing the faces of the cards in a deck, asking your helper to remember the name of one card. Once they have done that, you close up the deck, hold it to your head and begin to go into a deep state of concentration or constipation depending on how dramatic you think a card trick should really be. Suddenly it comes to you. (The name of the card that is.) This is unbelievable! Believe it or not, the name of the card you are thinking of is…Goober! You talk about your coincidence. Here's about when your helper will start to look at you like you have been struck by lightning.? What? I don't get it. Oh yeah, you forgot to tell them something. Sure, the cards have the regular face names, values and suits that you showed at first but they also have names on their backs, human names. Turning over the pack you see handwritten in black marker, human names; Joey, Sandra, Gabe, Max, Nancy, Betty and so on. ? When your helper finally tells you what the face name of their card was, (Let's say it was the Ace of Spades) you find that card in the deck. You flip over the card and right there, on the back, “You gotta' be kidding me!”; is the name, “Goober”. Of course the name won't really be Goober (unless Goober really is your name and we're sorry about that). The name is your name…you! This is an extremely entertaining and easy to perform trick with a great surprise ending. Don't forget to let us know what name you need for your deck. If you think The "You" Card Trick sounds impossible, imagine this ultimate version. You tell your helper that his card's name is Goober. You get that same "what an idiot" look back from him and ask him what card he thought he saw. He tells you he remembered the Ace of Spades (or whatever card he really says) so you remove it from the deck, face up in front of him. Now you explain that the cards all have human names and you go through the entire deck looking for a Goober but guess what? The deck is Goober-less. Imagine the surprise when you helper lifts his own card and finds the name Goober (or your name, you get it right?) on the back. Once you master the use of this gimmick you can even make up your own original mind blowing card magic using regular playing cards. You get the custom-made deck, a large supply of the magic gimmick, step-by-step instructions and performance tips. Have a spectator select a card from the deck. 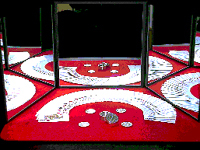 The card is cut back into the deck and the entire deck is held between the spectator's hands. You explain that you know what card he chose. You tell him that magicians, professional gamblers, and card sharks all consider one card in the deck to be "The Money Card" and you offer to demonstrate. You reach into your pocket and pull out a quarter. You place the coin in your hand and squeeze it over top of the spectator's hands and the now clammy deck. When you open your hand, miraculously the coin has vanished. The spectator now places the deck on the table and when it's spread, there on top of one card is the quarter. For the first time you ask the spectator to tell you the name of is card. When he tells you, you lift the quarter off of the card and turn the card over. It's a perfect match. that's a miracle right in the palm of your hand. A secret gimmick does most of the work with the cards and our detailed step-by-step instructions explain a very effective coin vanish. You only need to worry about catching a fainting spectator. 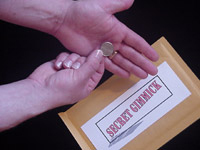 For years, many Professional Magicians have used a number of secret little gimmicks to instantly vanish a coin (among other things). This is the one that really works every time and now, you can do it too without the hours and hours of knuckle busting practice. Place a coin in the palm of the hand, close your fingers around it, say the Magic words or wiggle your nose and presto, when you open your fingers, the coin has gone. If you want, you can make it re-appear by pulling it out of someone's ear, your pocket or eye socket. This is a great way to vanish the coin in The Money Card Trick above. “One of the essential elements of practicing magic is the ability to view practiced sleights in real-time." You need to be able to see what you are doing, when you are doing it. "How did Magicians practice before Magi-flect?" They practiced a trick by themselves until it was ready to show their poor families. They looked at a reversed reflection of what they were seeing, not what their audience would see. Videos are great later, but a Magician needs to see what's being practiced now so mistakes don’t get a chance to become habits. "So what makes the Magi-flect such a hot tool?" Here’s a great way to get some fantastic Magic and save some cash too! Magi-Quicks Manuscripts and full color photographs carefully guide you step by step through the creation of some of the greatest Magic effects ever. The cash just seems to keep on coming and coming! If you think making cards appear from thin air gets some attention, wait ‘til you start magically making money appear! 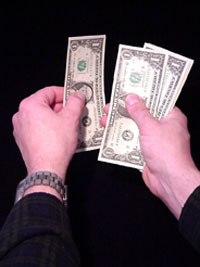 6 dollar bills (or you can use fives, tens, twenties even hundreds if you want to make some eyes pop) are shown and clearly counted; there are 1-2-3-4-5-6. Now 3 of those bills are removed and placed aside in full view. The bills are counted again and guess what? Yup,…there are still 1-2-3-4-5-6; (What the…?)! Okay, another chance; 3 bills are once again removed and placed aside in full view. Once again, the bills are recounted and there are still 6 bills left. This is repeated again and incredibly...it's repeated again! Man oh man, talk about your passin’ the buck! Where is all of that moola coming from? This must be Magic! This is a trick that you can present as a serious display of your ten talented talons (that’s your fingers) or as an audience rib-tickler. The bills just seem to keep coming and coming and coming! This is a great trick to “theme” with patter (a story) about sales, saving, values, dreams coming true or even shopping. Your own creativity is the only limit to the possibilities of this easy-to-carry miracle with big time visual appeal. 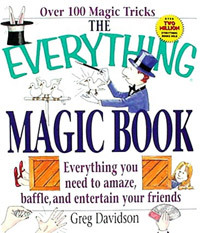 Easy-to-follow Magician’s Manuscript, assembly tips, secret instructions and photographs showing both “in action” and “behind the scenes” construction and performance views. This is the same great effect as Six Bill Repeat (Magi-Quicks Manuscript #5) except it uses playing cards. Hey,...this guy is good! Where are all of those cards coming from? This is also an easily themed trick. Your own creativity is the only limit to the possibilities of this easy-to-carry miracle with Big Time visual appeal. A “quickie” you can carry & perform anytime you want to be amazing! Look like a real Pro…now! A single playing card is shown in one hand. The opposite hand is shown empty and simply waved over the card. 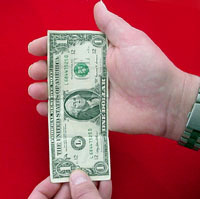 Instantly, the card transforms into it a genuine dollar bill! Instead, you might want the card to change into a five, a ten, a twenty…even hundred. Either way, this trick is super impressive and will stop ‘em in their tracks.